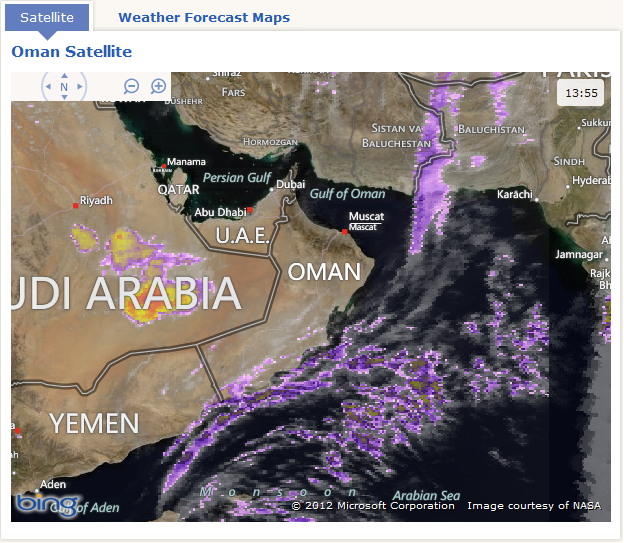 Home / blogs / weather / Rainy weather ahead? Well it rained a little last week, and a quick look over at AccuWeather shows thunderstorms in store for the rest of the week with a return to sunny weather by Friday. No need to run off like headless chickens and buy all the water from Al Fair again though, it seems mostly electrical storms with a side order of drizzle, the worst day currently predicated to be tomorrow, Tuesday. So I guess the order of the week should be... don't bother to wash your car. I should have known, seeing as I just washed my car today. Typical. In other news, local blog How to live like an Omani Princess has blogged today about some cheap hotels in town you may want to consider if you are visiting Oman on a budget, or for some reason need a cheap room in the city. I thought it was some pretty good information that's otherwise hard to find on t'internet. Samara Hotel in Al Khuwair! Behind Muscat Bakery/Little Gold Mosque. 25 Rials a night. Clean rooms. 35 for a suite with a kitchen & living room. The Ministry of Tourism has finally realised that the A+ demographic is not really that interested in oman as a destination and are realigning their efforts to attract the more 'middle of the road' traveler. In light of that, this is a very timely post and very informative. The SAS Rad is something like 150 Rials a night- are they kidding or what? That is a 3 star (at best) hotel in Europe and 2 star (at best) in New York city but here they charge 5 star rates. Whatewahhh are you insane? The Radisson is a four star hotel and meets all the international standards of a four star hotel good leisure facilities, nice pool, business center and a choice of bars and restaurants. It's primarily a business hotel and is not trying to be a 5 star resort. Rooms are expensive there but they do very good deals with companies and for events so have a high occupancy rate. Radisson hotels are a chain which sticks to a proven formula for business travellers and it works. I can certainly say i've been in far worse 3 stars in Europe all be it and a much lesser cost. Nice on Bob- let's have a chat with all the tourists and make sure they all book through a company that gets a good rate. Seriously- you think it is worth 150 rials a night? PS- never said it was a 5 star resort. I agree with whatewahhhh - the Muscat hotel rates are ludicrous. No sane tourist would spend the kind of rates demanded at the obvious places like the Hyatt, Chedi etc. These hotels survive off of businesses/companies and long-stayers. Tourists dont get company rates so they lose out. Muscat, in my opinion, doesn't have a great deal to offer a tourist anyway. Once you've visited the Grand Mosque and Muttrah/old Muscat what is there to see? better to get out of the city. The rest of Oman is so much more appealing. I wish Oman would create more opportunity for budget/backpacker travel. The lack of pubic transport and the crazy rip-off prices demanded by most tour companies just to drive you somewhere and back is outrageous. But the point is people do stay in them because the service offered and facilities provided are of a high standard. Oman will never be a budget or back pack destination. I have stayed in Radisson countless times and pay approx half of the published internet rate as the company I work for does business throughout the world with Radisson. If I was paying for it out of my own pocket I would probably feel differently. Oman and Muscat in particular are expensive for tourists, expats and locals however I doubt very much it will ever change. I think very much Oman is backpackers country. The best of Oman is found in rural places and the camping. Beaches, wadis, old forts ect. There isn't enough accomodation priced at what it is worth and that is a problem since it makes places that call themselves "resorts" charge a bundle for what I would call at best a motel room or campsite ect. . Though I maintain that the Chedi, Al Bustan, and Al Husn are worth their price tags. Luxury is luxury and I think the local population that can afford them keep them going. Other hotels are good for business not tourists. If tourism is so important, hotels have to cater to the other demographic. Thanks Susan for that one! Strong Windy Weather Ahead too...haha. I was at Al Makan yesterday night and the strong wind blew the whole projector Tv screen off. Everyone who were sitting outdoor, immediately ran inside to take shelter from the strong wind. By the way there is a new hotel opening soon located at Seeb area. Its call the Eastin Residence Muscat. Starting rate from 50 OMR, include Breakfast, Internet and Airport transfer. 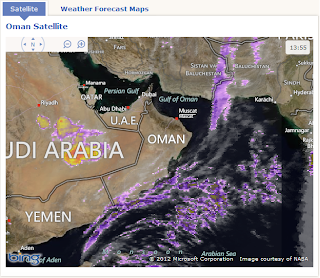 Checking the weather condition is wise whenever you're planning for a vacation. Last month it rained the whole time during our stay at Omni Rrlando Resort.